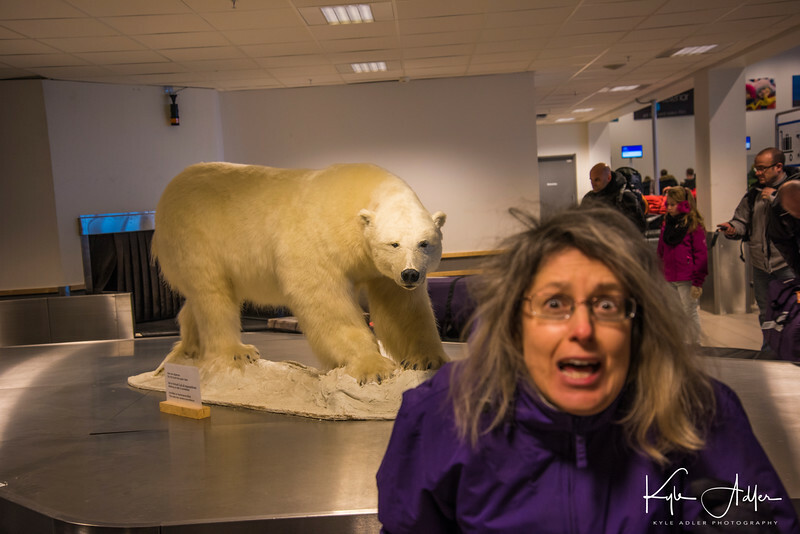 A polar bear prowls the arrivals hall at Svalbard Airport. What new horrors will await travel photographers in these troubled times? The life of a travel photographer is inherently complicated because the cost, fragility, weight, and size of the photography gear we need is incompatible with the rigors of global travel. I’ve written several times before about strategies for selecting and packing gear so as to take along just what we need and maximize our chances of keeping it safe during our travels. But the times, they are a-changin’. The US and UK governments recently instituted regulations banning all electronic devices larger than a smartphone from carry-on luggage on flights originating from 10 Middle Eastern and Northern African countries. Before long, these restrictions could be extended to flights to and from other countries. Camera gear is likely to be explicitly or implicitly categorized as electronic devices, so quite soon we may find ourselves obligated to check all of our gear in the hold of the plane whenever we travel. In today’s post, I will share some thoughts on how travel photographers could handle such a challenge. Laptops are already problematic for air travel. They must be inspected separately from other carry-on items, leading to delays at airport security areas. Their batteries can, in rare situations, catch fire. And of course their use is always banned during portions of every flight. They are expensive, breakable, and highly coveted by thieves. And the data contained on our laptops must be very carefully protected. For these and other reasons, I already try not to take my laptop with me on most trips. There are image backup strategies, which I’ll cover later in this post, that do not require use of a laptop. I don’t tend to do much captioning, post-processing, or sharing of my images during the trip, preferring instead to take care of these tasks upon returning home. On certain trips, especially when I am leading photography tours or workshops, I do need to take the laptop to get my job done, but I would recommend not bringing along a PC unless it’s really needed. In the future, as regulations may spread requiring that laptops be placed in checked baggage, I see no good alternative other than purchasing a hard-sided and well padded case such as a Pelican brand case to hold the PC. Regrettably, it seems likely that most modern camera gear will be considered “electronic devices” for the purposes of these sorts of airline restrictions. Today nearly every camera, lens, and even many accessories contain embedded electronics, so they will almost certainly be included under these types of bans. While until now I have always managed to carry on all of my gear on every trip, I see the winds shifting and in the near future I expect to need to be able to securely pack all of my gear as checked baggage. Obviously, a hard-sided and well padded, customizable case will be required for this purpose. I don’t yet own such a case, but many of my photographer friends swear by cases made by Pelican. Here’s one I am considering purchasing soon to hold most of my gear when I travel. It is affordable, very durable, offers a good deal of physical protection, is lockable, and also rolls on solid wheels that can support a lot of weight. I will need to do more homework to determine whether this particular size of case will adequately fit all my gear. Note that I generally do not recommend products I haven’t personally used, but this item is representative of the category of hard-sided cases we travel photographers will need to consider purchasing. When checking camera gear, it is imperative that we remember to carry with us into the cabin of the airplane all of our memory cards that have images on them. I’m only being semi-facetious when I say I’d rather part with my prescription medications than with my brand new images during a long international flight. But regardless of what new regulations may soon be issued about what items we can carry onto our flights, it is essential to set and follow a good backup plan for our images when we travel. Gear can be lost or stolen, memory cards corrupted, and so on. Images we make during a trip *always* must be backed up so that there are at least two files in physically separate locations for each image. Many photographers use a laptop for their image backups while traveling, but for reasons I’ve already mentioned, I prefer not to bring a laptop unless it’s absolutely required. Instead, I make the time every night during a trip to copy that day’s images to a second memory card, which I store separately from the ones in my camera bag. I do this in-camera because my camera bodies have dual memory card slots, but if your camera has only one slot you can backup to a portable hard drive or another memory card using a card reader. Some cameras have WiFi and/or Bluetooth capabilities, which can facilitate backups to a separate device such as a smartphone or even to the cloud, though network connectivity in many parts of the world is rudimentary at best. A backup strategy that I use when the images are extremely important is to shoot simultaneously to both of my camera’s memory cards, so that the instant the image is shot it is recorded as two separate files. I will then store one memory card separately from my camera gear. Again, this approach will only work if your camera has dual card slots. A final word of advice: bring enough memory cards so that you won’t have to reformat any of them during the trip. It’s already a hassle traveling the world with a lot of camera gear. Most likely, the hassle factor will increase soon as a result of the turmoil in our modern world. I’m not looking forward to these changes, but I do expect they will happen soon, so I am rethinking my packing and traveling procedures to be prepared. Hopefully, some of the thoughts I’ve shared in this post will help others get prepared, as well. What gear and procedures do you use to travel safely with all your gear? How do you see your approach changing as new airline regulations are enacted? Please share your thoughts here. Want to read more posts about gear? Find them all here: Posts on Gear.